During the German occupation of Estonia, Russian stamps were overprinted for local use in Pernau (Pämu). The original town was founded in 1251. It was called Perona (German - Alt-Pernau, Estonian - Vana-Pämu), but it was destroyed in 1600. Another nearby town, called Embeke (German - Neu-Pernau, Estonian - Uus-Pämu, was founded in 1265, and it later became known by the German name of Pernau. The town became a member of the Hanseatic League, and it was an important harbor for Livonia. Today, the city of Pämu is a popular Summer vacation resort, known for its hotels, restaurants, spas, and beaches. 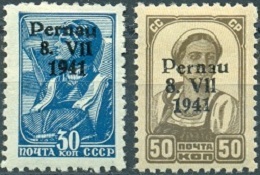 Between August and September of 1941, the contemporary 1 K., 2 K., 3 K., 4 K., 5 K., 10 K., 15 K., 20 K., 30 K., and 50 K. definitive stamps of the Soviet Union were overprinted "Pernau / 8. VII / 1941", for local use in Pernau. 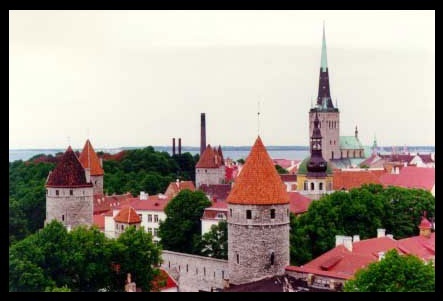 July 8, 1941 was the date the occupation of Estonia began. These German occupation overprints exist in two types. The type 1 overprints have Roman Numerals (VII) indicating the numeral one in the month. The type 1 overprints were issued on August 16, and only the denominations from the 5 K. through the 50 K. were used. Mint examples are moderately scarce, and used examples, especially those on cover, are very scarce. The 50 K. denomination, with the type 1 overprint is RARE. The images above show the issued denominations, except for the 50 K., with the type 1 overprint (Mi. #1I-10I, Sc. N/L). The type 2 overprints have regular numerals (V11) indicating the numeral one in the month. The type 2 overprints were released on September 16, and these overprints were used for all the denominations from the 1 K. through the 50 K. Most of the type 2 overprints are not very expensive. The Michel Catalog indicates that these later overprinted stamps did not see any postal usage, and that the few used examples encountered are favor-canceled stamps. 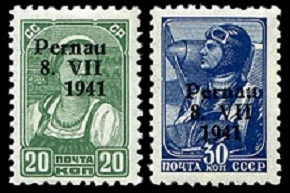 The complete set, with the type 2 overprint, is shown above (Mi. #1II-10II, Sc. N/L). In November 1941, Estonia was incorporated into the Reichskommissariat Ostland, and German stamps, overprinted "OSTLAND", were used.